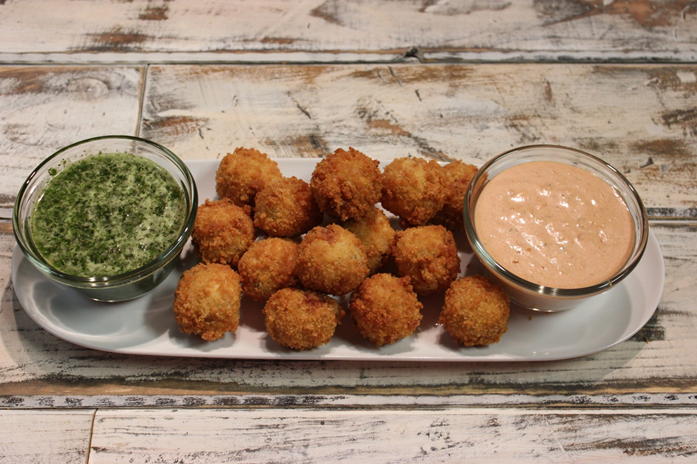 With two dipping choices, these fun little trout croquettes make the perfect appetizer for a buffet! Place the trout on a foil lined cookie sheet and open the trout flat and sprinkle with 1 tbs. Bayou Blast, salt and pepper and fold back over. Place the trout in the oven and bake for 20 minutes, then remove and set aside to cool. Once cool, pick out the fish into small pieces and set aside. Melt Butter in a small sauce pan and add minced shallot, minced garlic and 1 tbs. Bayou Blast, and sauté 1 minute. Pour in mustard, horseradish and Half & Half and whisk over medium heat until thickened to a smooth paste then remove from heat. Add the mayonnaise, capers, and 1/2 cup breadcrumbs and mix through. Gently fold in flaked trout, add a pinch of salt and pepper. Chill in the fridge for 6-10 hours. Use an ice cream scoop or a tablespoon to make small balls out of the mixture. Heat the oil to 350 degrees in a deep fryer or pot. In 3 small bowls, add 2/3 cup flour to one, add beaten eggs to the second, and 1 cup Panko to the third. Dredge the trout croquettes in flour first and shake off the excess, then dip into the egg, and then breadcrumbs and immediately deep fry for 2-3 minutes, until golden brown. In a non-aluminum saucepan, combine the vinegars, corn syrup, fish sauce. Bring to a boil and stir. Remove from heat and let mixture cool to room temperature. In a blender, add the cooled syrup, minced chiles, garlic and sugar and process on low for 10 seconds. Add basil, mint and lime juice and briefly process until minced. Add salt and pepper to taste. Store in a covered container in the refrigerator for up to one week. Mix all ingredients in a lidded container. Store up to 2 weeks in the fridge. The Thai Basil Sauce can also be used for other grilled fish and seafood.